A few weeks ago I talked about the release of a new computer game called the Bug Butcher. Well, after writing about it and watching all the promotional videos I decided to give it a try for myself. My conclusion: It’s fun, lighthearted and an overall great game for when you’re looking to kill some time. I set my expectations low, fearing that the promos would prove to be infinitely better than the game itself, and was happily surprised that the graphics, gameplay and overall experience was accurately displayed in the trailer. So let’s get into the bug butchering part, shall we? The game is almost instantly addicting. As Harry you fight your way through various levels of the infestation, each displaying a similar layout. 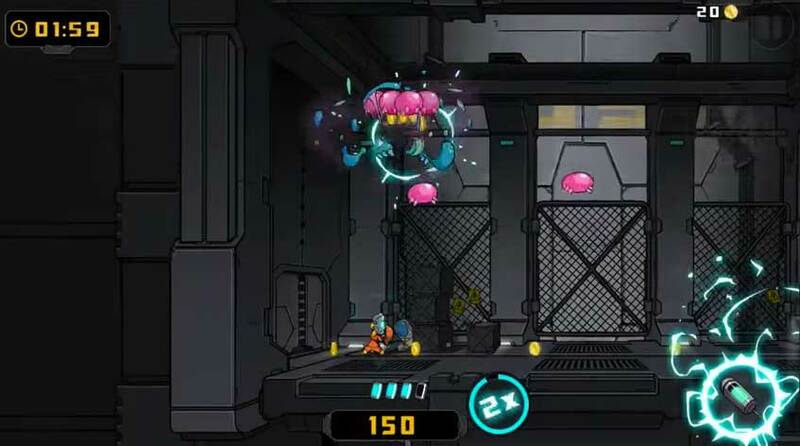 Throughout the game, you’ll find items that will temporarily boost your damage or speed, and weapons such a laser beam, lightning gun or rocket launcher. These little upgrades, along with an upbeat, electric soundtrack, definitely keep things interesting. And what do you really do all this work for? Coins. Your reward for killing the bizarre insects is a slew of coins that can be used for upgrades that will help you make the most of these helpful items. In my original story I mentioned that sharp reflexes were necessary for this game. After playing this for awhile I have discovered that this is most definitely the case. Each level brings a new array of bouncing insects spitting all sorts of mysterious liquids (At least I think the small orbs of light are liquids) in your direction. When they aren’t spitting at you, they are trying to squash you. Being agile is the key to keeping Harry alive. That being said, there isn’t so much happening on your screen that you lose awareness of where your character is and what he is doing. So that’s a plus. From the trailer you see that your character must rescue scientists. In actuality, they are the epitome of damsels in distress. They can’t seem to get it together, which is both funny and a tad annoying the farther you get in this game. Between funny-looking insects and sassy dialogue the Bug Butcher is a perfect arcade game. And what do I mean by that? You’re not going to lose any sleep over this game. It’s just a great game to pick up with you have a bit of free time and want something instantly entertaining. You can buy The Bug Butcher for $7.99 here.